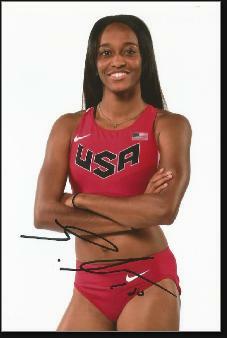 English Gardner was born April 22, 1992 in Philadelphia and grew up in Voorhees Township, New Jersey. She had an unusually close relationship with her parents. Her mother, Monica—an English teacher—beat cancer when her daughter was a teenager. English helped her mom through chemo and radiation with her upbeat attitude and bubbly personality and also looked after her siblings. Monica believed her daughter was destined for greatness, and as she developed into an elite prep sprinter—first with her dad and coach Anthony and later at Eastern Regional High in Voorhees, it seemed these dreams were going to come true. Anthony had been a star jumper—long jump, triple jump and hurdles—in high school and later at Delaware State. In 2004, when English was 12, he took her to the Penn Relays. There she called out to Lauryn Williams and yelled, “I’m gonna take your job someday!” By this time, English had been entering and winning track meets for five years. Her confidence got her through trying times on several occasions, including twice when the family found itself temporarily homeless. English fit right in with the sports culture at Eastern Regional. Among her athletic peers were future NFL defensive backs Logan Ryan and Eli Apple. But it was English’s sprinting as a freshman and sophomore that made local headlines and attracted college scouts. Then disaster struck. As a junior she tore up her right knee playing in a flag football game to raise money for cancer research and missed the entire track season recovering. The only college that didn’t write her off was the University of Oregon, who stuck with her as a senior. She graduated in 2010 and headed to the great Northwest, scholarship in hand. English not only recovered from her knee problems, she won five NCAA titles as a member of the Ducks track and field team. She captured 100 meters titles in 2012 and 2013, an indoor 60 meters title in 2012 and two 4x100 relay crowns. She also won the USA Outdoor Track & Field 100 meters title in 2013 and won silver at the World Championships as a member of the US 4x100 squad the same season. Years later, English’s historic recovery from her ACL/MCL tears would inspire a similar comeback by Jonny May, a lightning fast rugby star who suffered the same injury. Heading into the 2016 Olympics in Rio, English was one of the favorites in a super competitive 100 meters. She made the US team by winning the 100 at the Olympic Trials on her “home track” in Eugene, but nearly missed out because of an anxiety attack prior to the semifinal heat. Four years earlier, a similar attack had led to a seventh-place finish in the Trials and a lost opportunity to run for her country. In Rio, English finished a disappointing 7th in the 100 meters. She redeemed herself as a member of the 4 x 100 team, running the third leg in the final, with the Jamaicans hot on her tail. By the time she handed off to Tori Bowie, the Americans had a 3-meter lead. Bowie lost a little ground but had enough down the stretch to break the tape for the gold medal. English was enjoying a strong 2017 season before an injury sidelined her for over a year. She returned to the track in August 2018 at a meet in Roverto, Italy and stunned the crowd with a win in the 100 meters over favorites Michelle Lee Ahye and Imani Lasiquot.